Lilach Nethanel was born in Netanya, Israel, in 1979. She received a BA and MA in French literature from Paris University and a PhD from the Department of Jewish Literature at Bar-Ilan University, where she now teaches Hebrew and Yiddish literature. During her research, she found the manuscript of a previously unknown novel by the classic Hebrew writer David Vogel in the literary archives, and contributed to its publication in 2012 under the title Viennese Romance. Nethanel is also a translator from French to Hebrew. 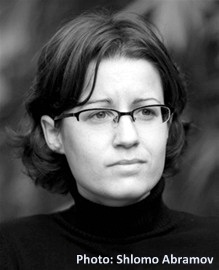 She received the Ramat Gan Prize for Debut Literature for her first novel, The Hebrew Condition (2010), and the Bernstein Prize for her second novel, The Old Homeland (2015).